The Georgian period was a good time for to be a surveyor. At home estates needed mapping to ensure that you could fend off land-grabbers, so you needed to know where your boundaries were. Surveying was needed so that you knew what your income would be from your land, as produce and as rents. Tied in with this was the need to know how much to pay the church as tithes, or 10% of your produce. Tithes would not be abolished in England and Wales until 1839, when they were converted to tithe rentcharges. Rentcharges were finally abolished in 1936. Surveyors were also required in the colonies for the new lands that were to being claimed and had to be mapped. But there were more pleasurable requirements for surveyors; if you had the money. Old habitations were being either remodelled or completely rebuilt, in the new classical style. In the early part of the Georgian period you may be setting out formal gardens, but later any person of taste would want the latest fashion of landscape gardens. There was also going to be a walled garden to grow your food. All of this would require the services of a surveyor. The chain is 22 yards long and consists of 100 links, sub-divided into tens that are marked with brass tags. My chain has marked tags that run from the handle to one, two, three, four, five and then decrease to the next handle so you can use it from either end. 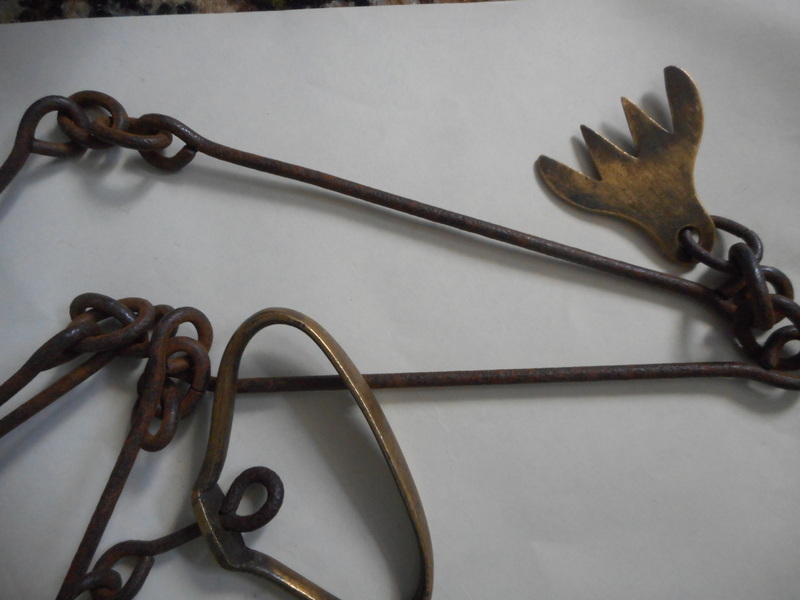 Links, handles and tags on a Gunter’s Chain. 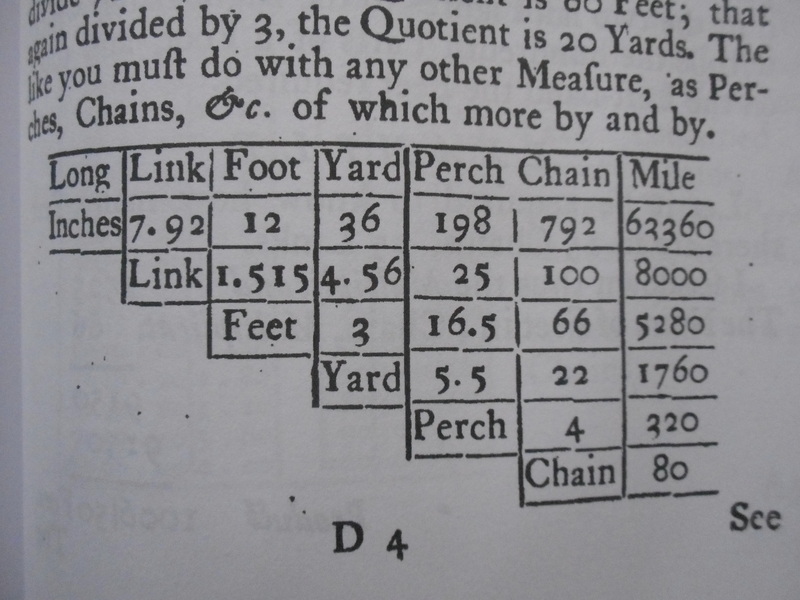 Ten square chains equal an acre, which was the common land area measurement. There are eighty chains to a mile. Reid’s table of measurements. All now obsolete in the UK. It is hardly surprising that a cricket pitch is twenty two yards long. The only flat and mown grass was at the estate lands and every estate would own chains. It is also very difficult to fiddle chain measurements to create a home-team advantage. The chain could be used to measure fields or even whole estates, by plotting out triangles to ensure the correct angles were maintained. Very few mathematical calculations would be needed. You could use a ‘Plane Table’ to plot the land. This is a small table set on a tripod and levelled. The tripod is set over a mark on the ground using a plumb line. Paper is fixed to the table and north marked from a compass. 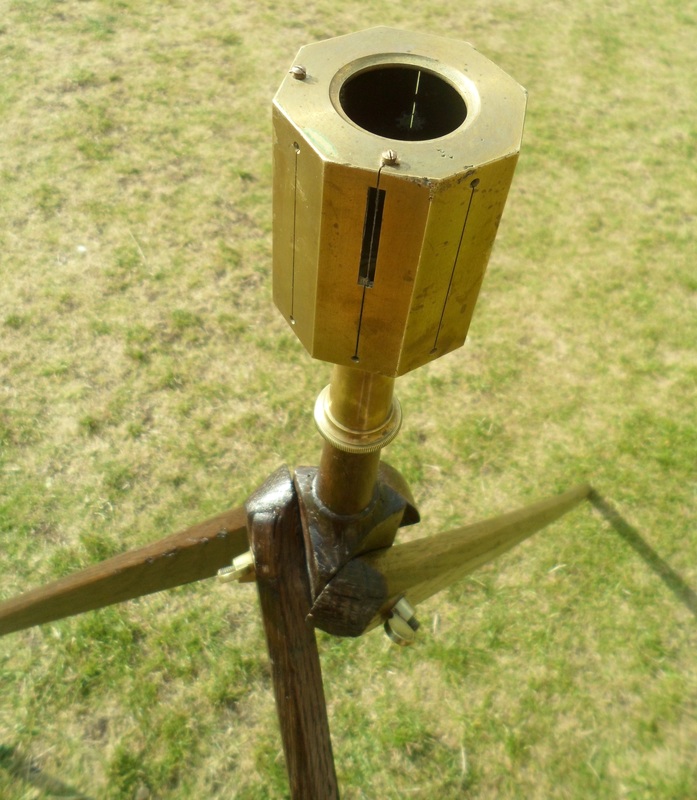 The surveyor uses an ‘Alidade’ made of wood or brass. He lines the alidade with the object that he wishes to put on the plan and then draws a line along the alidades edge. Using the same method, the surveyor proceeds to include any object that he wants on the plan. The next part is a very time consuming process. The surveyor and his assistant have to measure the distances from the plane table to the objects using the chain. Once the lines are measured and recorded it is quite a simple task to draw a plan or map. Again, very few calculations are required. A plane table and chains work very easily on flat and accessible ground, but if the ground is very uneven the chain measurements will be inaccurate. This is where a Circumferentor or a Graphometer are useful. 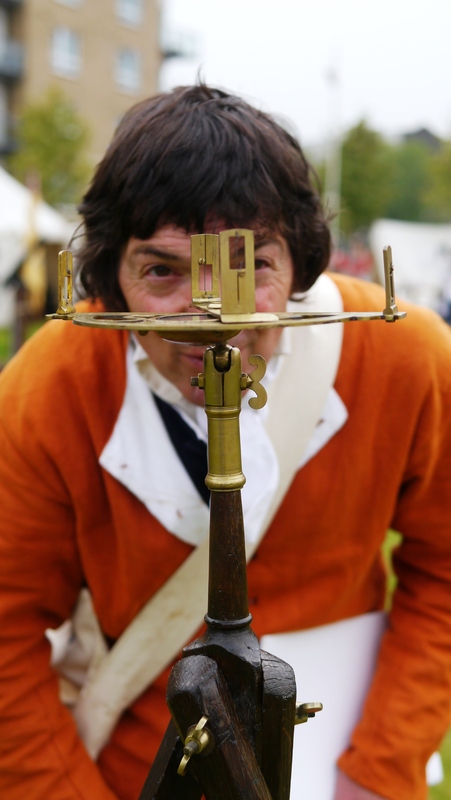 The Circumferentor is a circle of brass, with 360 degrees marked around the edge and had a sight that rotates around the middle. A compass is often included. 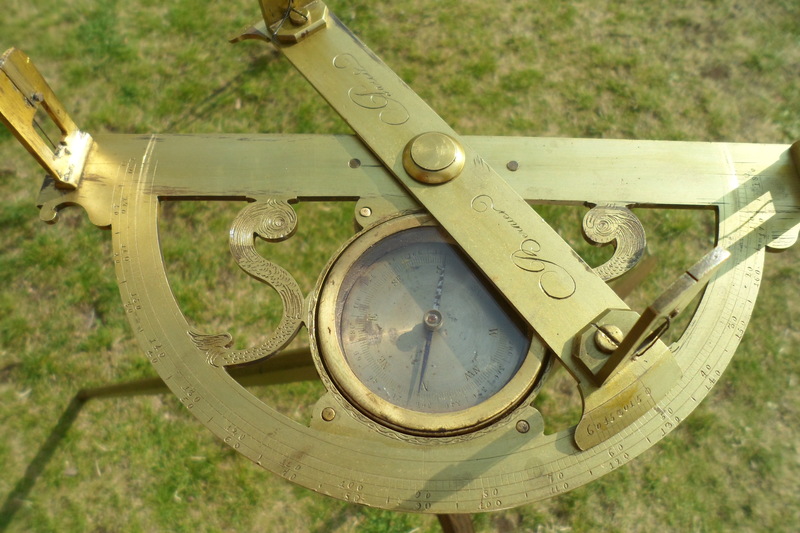 They were expensive to make, so many people used the Graphometer instead, as it was only 180 degrees, similar to a protractor. It also had a rotating sight and a compass. I have a Graphometer for the same reason. My graphometer on its tripod viewed from above. The Graphometer would be set up over a mark using a plumb line. The alidade is sited onto the objects to be included in the survey and the angles are recorded in a book. The Graphometer is then moved a measured distance and set up again over a mark. The same objects are sighted again and the angles recorded. You now have a base line of a known measurement and two angles. It is fairly straightforward to draw this to scale, and then a protractor and compass, to put in the angles. Once again very little calculation is required. 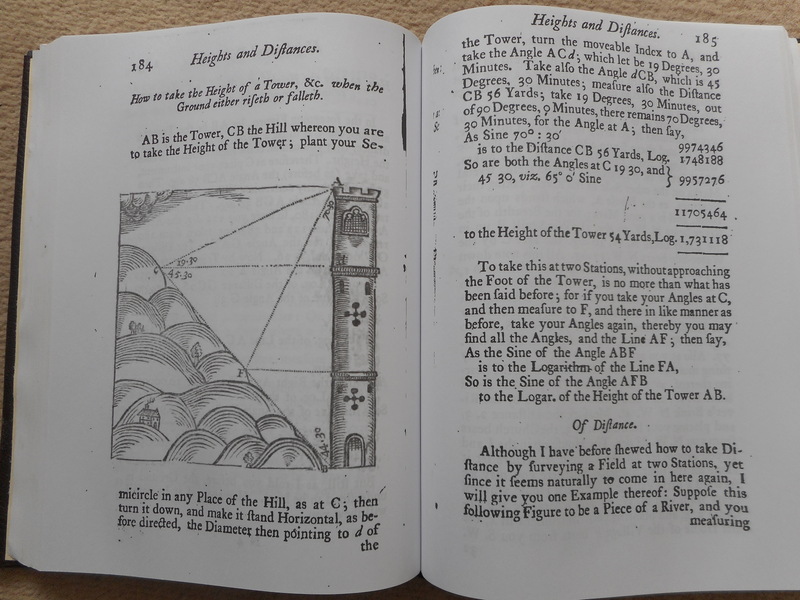 I have a reproduction copy of John Love’s, ‘Geodaesia, or the Art of Surveying and Measuring Land made easie’, third edition, printed for W Taylor, 1720. This is very useful as it not only includes a description of the surveying and drawing equipment that you will need, but also gives exercises in drawing and surveying. Useful surveying tips in Reid’s book, Geodaesia. Even more useful nowadays, bit includes all the tables that you are likely to need for your work. I tried buying a book of Log Tables, but they are not available in the high street shops any more. Most shop assistants didn’t even know what they are. 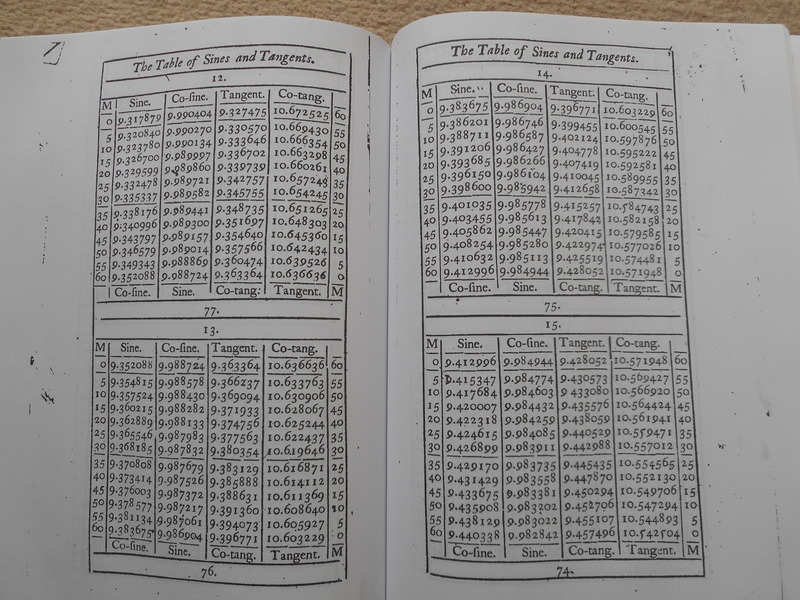 Log Tables in Reid’s book. To draw out a straight line on the ground for building foundations, walls, roads, avenues of trees or gardens you can use ranging poles. The surveyor stands at the start point, having placed a visible pole at the far end of the line. He pushes a pole in the ground at the start point by standing behind the pole and lining it up with the end pole. He then directs assistants to place poles between the two; much as the Romans had done. In his book ‘The Scots Gard’ner’ of 1683, John Reid suggests that you use a ‘Surveyors Cross’ to help you line up with buildings more easily. He suggests that instead of buying an expensive one that you make your own from two pieces of wood set at right angles to each other with sights at the ends. It is a very similar idea to the Roman ‘Groma’ that used lead weighted strings as sights. 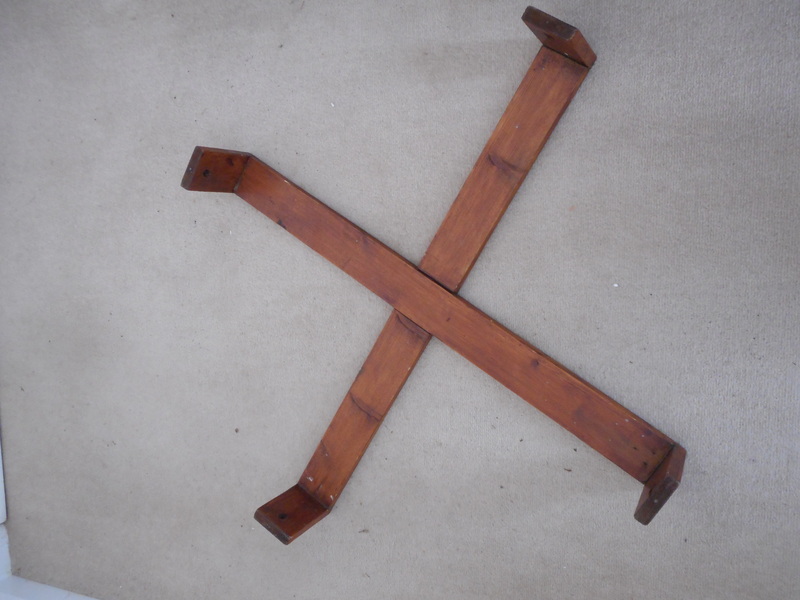 I have made my own wooden cross, but it is rather large. Professional surveyors could have used a more portable brass cross. I saw an egg-shaped one for sale that was of Georgian date, but it was extremely expensive. A Surveyors Cross. This one also allows you to sight 45 degrees. Drawing equipment usually included rulers, protractor, compasses and dividers, line drawers for ink lines, parallel rulers and pens. 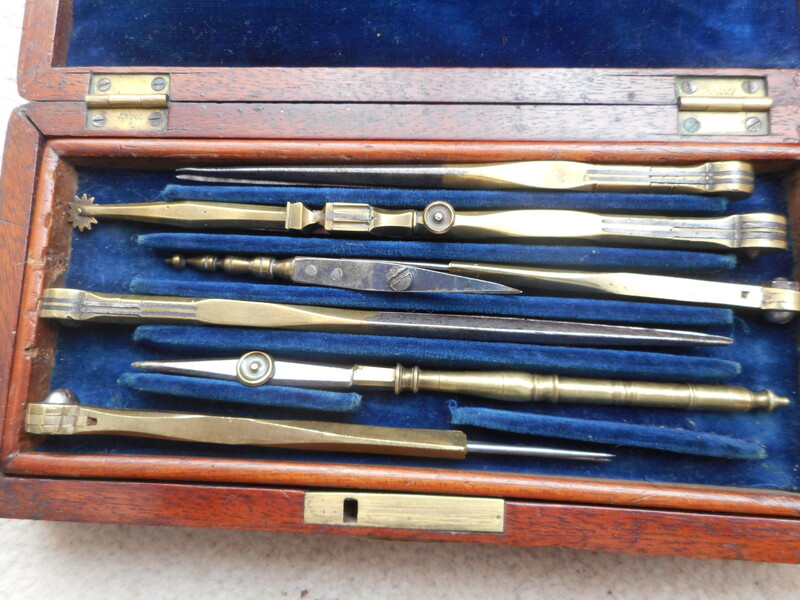 Drawing set. The Sector and rulers are in the bottom layer of the box. A sector for calculations was often included. 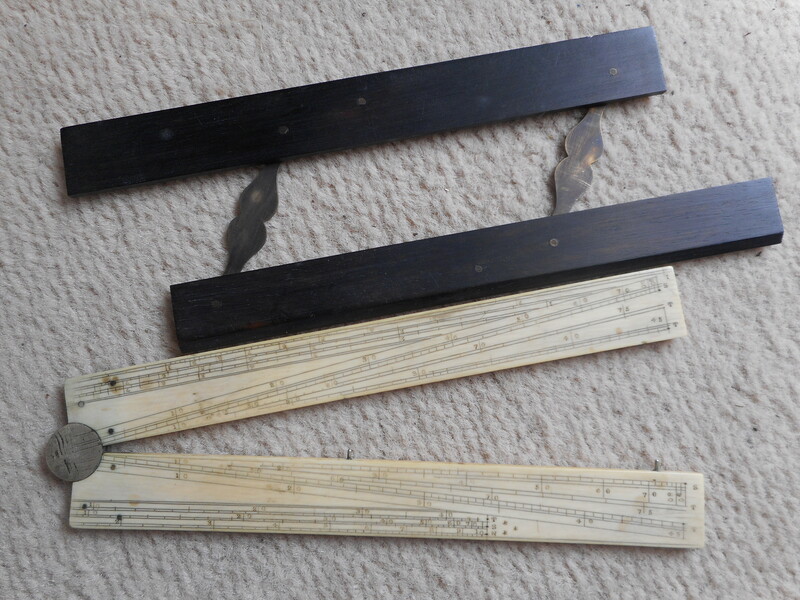 This was a primitive form of slide rule that used dividers to measure off the calculations. If your dividers were damaged the answers could be quite wrong. I am struggling to use a sector competently. Parallel Ruler and an ivory Sector. A scale replica of his tree wagon forms part of an anniversary exhibition at the Wincester Discovery Centre. Hello Caroline. Thank you for the picture. They made a replica for the CB 300 exhibition at Blenheim too. It isn’t a working model, but it does show how it would have appeared. Unfortunately the video they show, presented by Diarmuid Gavin, suggests the trees were simply ripped from the ground. this would be physically impossible, but would damage the roots so much the trees would not survive. Brown was a trained gardener and would not waste time on trees that would not survive. It is a shame that in this day and age people like to perpetuate myths rather than sort out the truth. Indeed, it is slightly despairing, such a basic fact is not understood! Even in this day and age, with the best available technology, trees require a great deal of expertise, skill, time and care to be moved to ensure survival. As you say, Brown, having trained, first as a gardener and plantsmen, would very much have understood that serious damage to tree roots, would not allow for their future success once moved. Your article is an interesting read and at the Winchester exhibition (mentioned by Caroline Watson) they do concentrate one gallery to making of the Brown landscapes’ and do indeed focus on the surveying equipment used. Fascinating to note that he would have used a pocket sundial to ascertain the time of day, relevant to aspects of his designs! It’s an exhibition we are proud to support and interestingly was opened Jilly Drummond, owner of Cadlands, which is Brown’s smallest surviving pleasure ground on the solent. i met Jilly Drummond at Blenheim where I was providing a display in their CB 300 exhibition. I hope to get to Winchester to see their display, but April is proving to be very busy for me and I may miss it.